Lady Gaga, Bradley Cooper, Sam Elliott, Dave Chappelle, Andrew Dice Clay. Written by Eric Roth, Bradley Cooper, Will Fetters. Directed by Bradley Cooper. 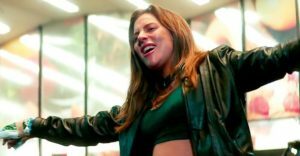 It was seventeen years between Janet Gaynor and Judy Garland, twenty-two years between Garland and Barbra Streisand, and now forty-two years between Streisand and Lady Gaga as the titular star in A Star is Born. I mention this only because I’m thinking about the disconnect I felt with the music in the 1954 version and about how much I enjoyed the music in this 2018 version. Some stories deserve to be retold in ways that connect to their intended audiences, and maybe this is one. Some people say once a film has achieved cultural icon status, there’s no point in remaking it, but I’m not one of these people. Art is consumed, but it is also created, and its creation is most often where the magic and beauty are, and if we didn’t all feel this way we would be stuck with one interpretation of Romeo and Juliet and one version of “All Along the Watchtower.” The world would be a poorer place. Is the world a richer place with this third remake of A Star is Born? It’s too early to tell, but it’s already spawned one hit single (“Shallow”) and Oscar buzz for its stars. Of the four films, it has the best music and possibly the best acting, and if anyone in the cast wins an acting Oscar it will be a first: Gaynor and Fredric March lost to Louise Rainer and Spencer Tracy. Garland and James Mason lost to Grace Kelly and Marlon Brando (The Country Girl and On the Waterfront—they never had a chance!). Neither Streisand nor Kris Kristofferson were nominated for acting awards, but Streisand did win an Oscar for best song. More important, Gaga and Cooper have something different to say in this telling of the tale. There was a hint of a statement in the 1976 film about rock music and pop, but here it seems to be the central theme. 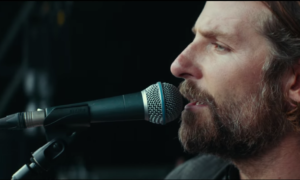 This movie is less about a relationship, less about self-destructive personalities, and more about music and success. This may also be its biggest shortcoming, but the shift in emphasis validates a third remake. Our falling star is now named Jackson Maine and our rising star is Ally Campana, and their meeting is very much like Esther’s meeting John in 1976. Ally’s singing in a drag show when a drunk Jackson stumbles in. Their connection is nearly immediate, and they get to know each other very quickly. Before they’ve been acquainted 48 hours, Jackson practically forces Ally onstage to perform one of her songs. She’s an immediate hit. The first half of this movie is better than any half of any of its predecessors. Cooper and Gaga are a joy to watch, crackling with chemistry and sincerity. 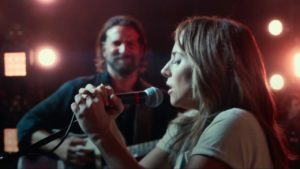 Cooper adopts a Kristofferson-like look and sound, while Gaga is all kinds of humility and sweetness Streisand couldn’t approach (and possibly only Gaynor equaled). Gaga’s music in real life doesn’t do a thing for me; if it moves me at all it moves me out the door. But here in their early scenes, absent the veneer of a pop show with all its choreography, makeup, costumes, and sheen, we have an actress perhaps less skilled than her opposite but making up for it with utter vulnerability. Ally on stage is likeable, but her pop music feels fake, and if that weren’t blatant enough a statement, there’s a moment where Jackson offers her a pep talk, saying her audiences will love her if she always effing means what she’s singing. But as Sam Adams wrote in his critique on Slate, “the further from Jackson’s influence Ally gets, the worse her music becomes.” Cooper’s message may not be as overt as Adams interprets it, but there’s so much in the setup about having a voice, having something to say, and trusting others that he’s definitely on to something. The worsening of Ally’s music doesn’t necessarily dictate a worsening of the story, but it is the case here, and the second half is a letdown after such a promising setup. 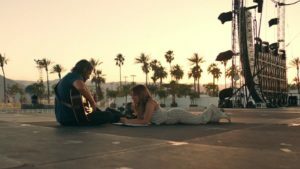 Still, my fondness for the film is salvaged by a decision Cooper the director makes near the end, giving us something none of the earlier movies offered, making 2018’s A Star is Born the best of the four.